You know those science fiction movies where the Earth crew lands on a planet populated by green furry creatures? They start talking to each other. They have these super translators that they got from the prop department. We don’t have those. So in order to travel to other planets we’re trying out “Translate Your World,” a $25 to $50 a month service that does translation in real time. It works like this: Each person goes to a special website where they see subtitles appearing on the screen in real time as words are spoken in any of 78 languages. It’s a lot like foreign movies: they say something in gibberish and you read it on the screen, then you do the same. This sounds just like using Google Translate but it turns out to be more. 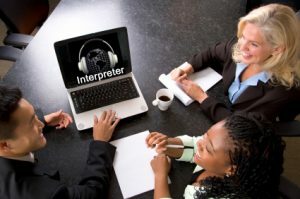 The “Translate Your World” software starts with Google Translate, Dragon Naturally Speaking, Siri and other systems and uses them to get a more accurate translation. If you say “the batter swings,” for example, the person receiving the message will understand you’re talking about baseball, not the Pillsbury Doughboy doing the twist. The next version will be voice to voice, no subtitles. You speak, they speak, and it all comes out in each person’s native tongue. Because of the cost and the necessity of being on a web site to get the rapid two-way translations, this service is likely to be used by business at first. But someday … we’ll whip out our smartphone and be able to order from the menu in Botswana land.